Utforska en favorit dagstur destination för Buenos Aires invånare på en rundtur i Tigre Delta kombinerat med en Rio de la Plata kryssning. Rid i en traditionell båt genom ett nätverk av våtmarker och kanaler, och lär dig om livet på deltaet när du passerar förhöjda hem, det ståtliga Tigre Art Museum och en lokal marknad. Tillbaka i Buenos Aires, njut av lunch medan du går längs med skepp och skyskrapor i stadens moderna Puerto Madero-distrikt och in i stadens nautiska livslängd, Rio de la Plata. 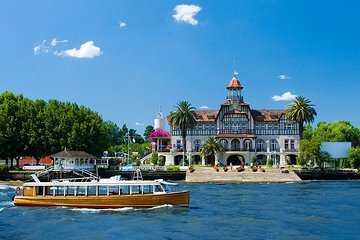 We thoroughly enjoyed sailing on the Tigre River. The homes along the Delta were unique and colorful. Our guide was very helpful. The lunch sailing on the Rio de Plata was enjoyable but the food on the cruise was so so. I would still recommend it. The views were very nice of the city of Buenos Aires. The weather was beautiful! This seems to be a new tour and it has some issues. The bus trip to the Tigre Delta and the boat ride were fun. There was also a trip to a market but it wasn't that good for presents--however Buenos Aires doesn't have much tipico places except the hippy fairs in any case. The problem was that the cruise and shopping made us late getting back to the city. Everyone on the tour but the three of us together ended the tour there, but we had signed on for the lunch. They then rushed us to the pier in downtown Buenos Aires for the lunch--we were almost two hours late but they had held the boat for us. Most of the people on the boat had eaten, they did serve us a nice meal as we cruised the Buenos Aires skyline. So I would say, do one or the other or both, but not together like this until they figure out the logistiics.